Fright Meter Awards Blog: Fright Meter Films Announces Their Next Production! Fright Meter Films Announces Their Next Production! As Fright Meter Films first feature Party Night, an 80's throwback slasher, wraps up post-production and prepares to hit the festival circuit, writer, producer and director Troy Escamilla is excited to announce that pre-production has begun on his next feature for Fright Meter Films, Stirring. 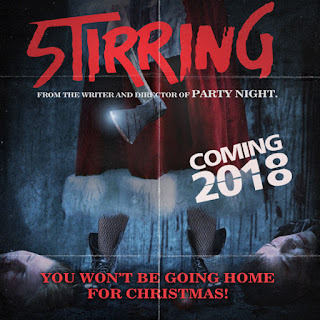 Stirring was inspired by Escamilla's favorite horror film, 1974's Black Christmas. The film will focus a group of students attending a Christmas party at a sorority house with a sinister past who are stalked by a bloodthirsty killer disguised as Mrs. Clause. Escamilla wrote the screenplay and will also direct the film. Though there have been some great Christmas themed slashers released in the past few years, such as Dismembering Christmas and All Through the House, he promises that this film will be different and unique in its own right and will be sure to please fans of holiday themed horror. He describes it as a mix of Black Christmas, To All A Goodnight, and Scream. Returning to Stirring will be Party Night star Billy Brannigan who will be portraying patient and understanding boyfriend Kyle. Horror icon and Scream Queen Brinke Stevens is also set to star in the film. She will portray campus police officer Julie Cornell, whose normally peacefully patrol routine is interrupted by a bloodthirsty killer. More casting announcements will be made in the very near future. In the meantime, fans can keep up to date with the development of Stirring by liking the official Facebook page: www.facebook.com/stirringthemovie, following the film on Instagram: @StirringTheMovie. Escamilla hopes to launch the crowdfunding campaign in January and film in June of 2017.